The memory is somewhat limited (5 Kilobytes all up, 3.5K usable) and software comes in slowly via a tape drive but this engaging little micro does a lot with a little. 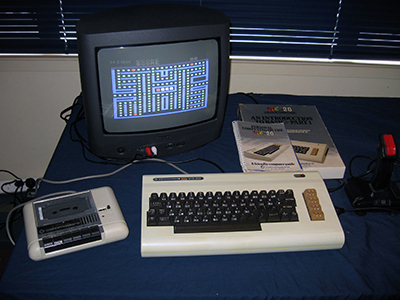 Announced in 1980 and sporting at its heart the ubiquitous 6502 CPU the VIC-20 was famous for being amongst the first home computers with colour and sound. Despite wild enthusiasm from the computer press the VIC-20 was never meant to be taken seriously. Its main purpose in life was to show off its fancy Video Interface Chip (VIC) but if it could educate and entertain at the same time (as well as make some money for Commodore owner Jack Tramiel) then even better. The VIC-20 was right at home spending an evening in front of an adoring family plugged up to a joystick and a home television. As William Shanter would say "Why buy a video game when you could buy a real computer?!". This model (along with James T. Kirk) did a lot to sell folks on the concept of a computer in the home. In fact you could say that the whole concept of the 80's "home computer" was born with the VIC-20! This unit was in bad shape when it came to me in late 2007. The internals had obviously suffered much abuse from previous owners. The VDU output was completely unintelligible showing just garbage. In the end, it needed not just one, but several chip replacements! With each new chip it got a little better until a complete recovery was achieved! Also, the case was originally much yellower than is pictured here. An external refurbishment returned it to a sparkling off-white colour. Sadly, that wasn't permanent and I'm now on the lookout for a pristine case. I've got a small collection of software and the original documentation to go with the Vic-20. I've also acquired a genuine datasette, rather than the C-64 substitution shown above. Another classic member of the pack.